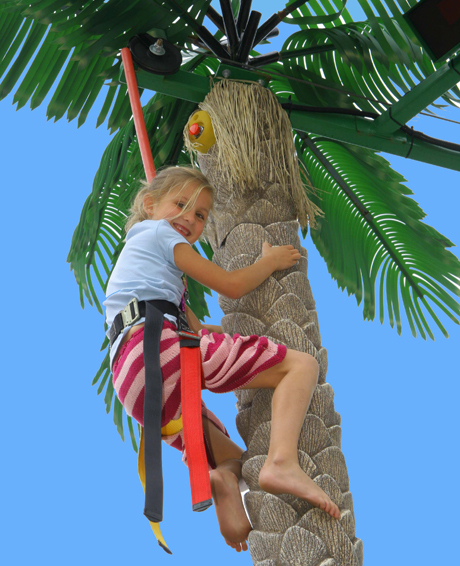 The Coconut Tree Climb offers a themed attraction that will become a memorable experience for your visitors. The 3 trees are easy to climb with a textured surface to grab and additional bolt-on handholds every 2ft (60 cm). The bolt-on handholds allow you to add or remove grips to adjust the skill level if needed. Climbers race against each other or against the clock (LED timer on the center tree only). This themed attraction is sure to provided an experience your customer will never forget! Three artificial trees are suspended by an engineered steel skeletal framework of welded 3/16” thick steel box tubing. It has a durable powder coat finish (galvanized is optional) to resists weathering and look like new for many years. The frame is wrapped in a front and rear banners to improve aesthetics and protect the mechanics. Artificial palm fronds are securely pinned in place on top of the trees to add the final touch. The structure bolts to a concrete foundation for stability. The Coconut Tree Climb may be installed outdoors or indoors, and custom heights are available to accommodate ceiling constraints. Our Auto-Belay safety system and Quick Harness combine to provide worry-free operations. The Auto-Belay is an advanced hydraulic system that automatically lowers climbers when they let go of the trees. It adjusts for the climber’s weight as long as they are between 40-250 lbs (18-113kg) to provide a slow and safe ride back to the ground. Our Quick Harness is a true one-size-fits-all adjusting from 18-48in (45-122cm) waists. With the snap of 3 parachute-style buckles you are ready to climb. Connect the climber to the safety line and the Coconut Climb does the rest for you!